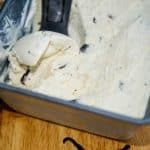 Make deliciously creamy ice cream with a few simple ingredients at home with this No Churn Chocolate Chip Ice Cream. I don’t know whether knowing how to make ice cream without an ice cream maker is a good thing or a bad thing, but it certainly is E.A.S.Y. 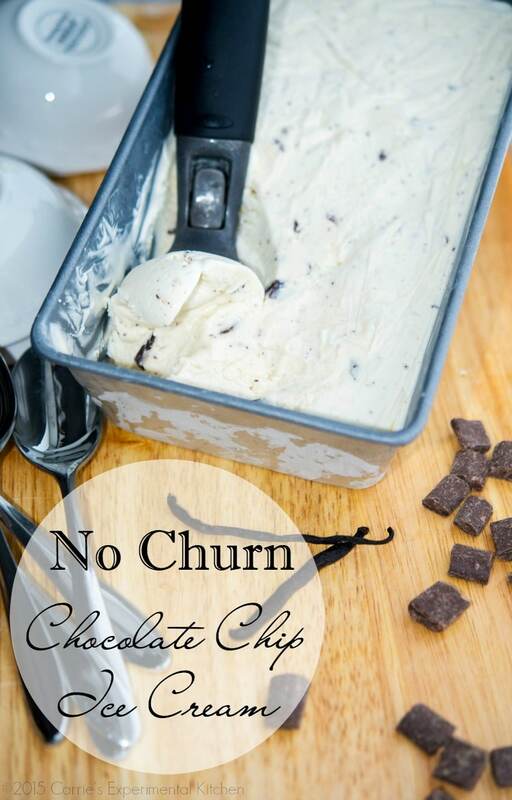 When I found a recipe for no churn ice cream from Like Mother Like Daughter recently and then made my version of their Key Lime Pie Ice Cream with my ice cream machine, I promised myself I would try a no churn version of ice cream and started out slow by making this 4 ingredient No Churn Chocolate Chip Ice Cream. Chopped Chocolate-you can use milk, semi-sweet or dark chocolate; chips or chunks. I had some semi-sweet chocolate Nestle chunks so I chopped up some of those. Once you have all of your ingredients, you’ll want to get out your stand or hand mixer and a large bowl. Whip the heavy cream into stiff peaks. Gently fold in the sweetened condensed milk, vanilla and chocolate by hand. Don’t over mix; just enough to form a creamy batter. Place ice cream mixture in a container and freeze for at least 2 hours. I used a loaf pan then covered it with plastic wrap, but have also used those family size plastic containers with a lid. I also like my ice cream firm so I froze mine for about 6 hours. That’s it! Easy right? This ice cream was a little sweet, but so creamy. Needless to say the family loved it so I’ll be trying other flavors again real soon. 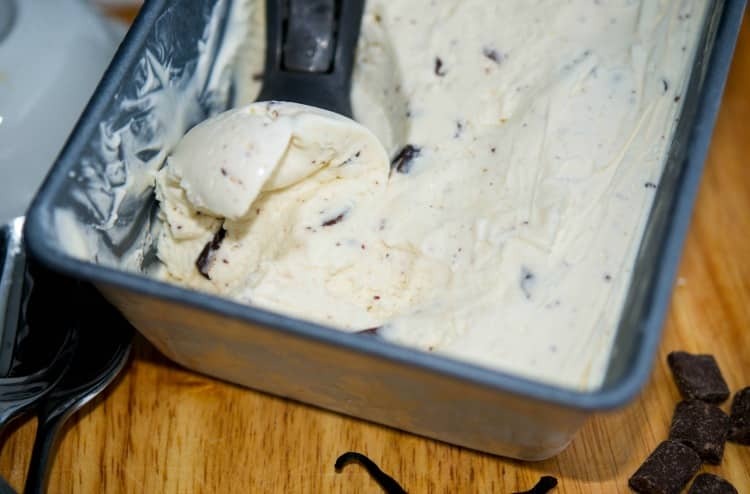 The entire process took only 10 minutes to prepare before freezing and in a few hours you can have homemade No Churn Chocolate Chip Ice Cream. ~Enjoy! Gently fold in the sweetened condensed milk, vanilla and chocolate by hand. Don't over mix; just enough to form a creamy batter. Allow at least 2 hours freezing time for the ice cream to set. For even more drool worthy ice cream and frozen dessert recipes, check out my Pinterest board with over 175 recipes to choose from! I tried making this ice cream, me I was absolutely stunned with the results! It was so creamy, not to mention easy to make, I’m a 14 year old so I made it for my family. One of my family members said it was really rich, but the rest of us couldn’t stop eating it! I let it freeze for about five hours, and there was some left over that I froze overnight and it was great the next day! Thanks for the recipe! !